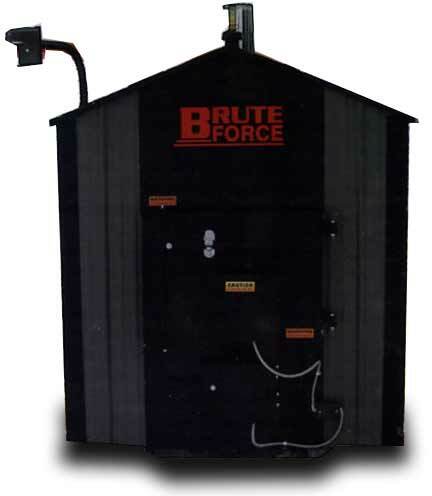 Brute Force outdoor wood furnaces eliminate the need to drag wood through your house to fire the stove. No longer will you need to worry about smoke in your home, or chimney fires. No need to wonder whether the cost of oil or gas will send your heating costs through the roof. Our outdoor wood boilers actually heat water in a tank surrounding the firebox. The hot water then circulates to your current heating system. It's a choice that can increase the advantages of wood heat and improve your family's living environment and stand of living while eliminating the fire hazards and time-consuming chore of tending a traditional wood service. The Brute Force can heat 100% of your home -- and your hot water. It can often pay for itself by eliminating your heating costs. It also burns larger pieces of wood and saves you time. The large firebox is designed for easy loading of wood, and the ash door makes ash removal very user friendly.